Lyster Dewey Diaries: What’s Inside? Lyster Hoxie Dewey was born March 14, 1865 in Cambridge, Michigan. He attended, and later taught botany at the Michigan Agricultural College, before moving to Washington, DC to become an assistant botanist at the US Department of Agriculture in 1890. 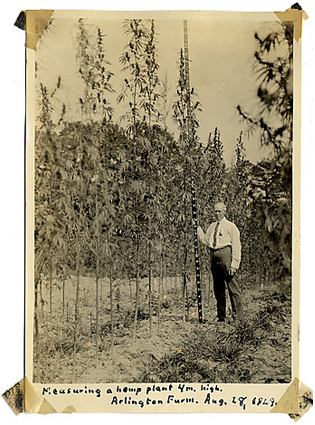 Dewey specialized in research for plant-based fiber production, which led him to study flax, jute, sisal, and hemp. This site features selected writings from the Lyster Dewey Diaries with a focus on his work with hemp. Dewey lived most of his life in Washington, DC, in the neighborhoods of Petworth and Shaw. His research commute involved traveling across the Potomac river to Arlington Experimental Farm where his test plots were cultivated. He also traveled around the country to areas where hemp was grown and worked with researchers and farmers in places like Lexington, KY and Blacksburg, VA.
Lyster Dewey wrote entries in his personal diaries and field notes nearly every day, from 1896 to 1944. He recorded everything from quotidian activities such as where he dined that day, who he met at the office, how his wife and family spent their afternoons; he recorded important current events, such as presidential inaugurations, developments in the many wars that occurred during his lifetime, notes on the weather, modes of transportation and his personal reflections. Often he refers to places in the city that still exist today, such as the Old Ebbitt Grill in Washington, DC; the Petworth and Shaw neighborhoods; parks and churches.